(Calp. 25-04-2018). 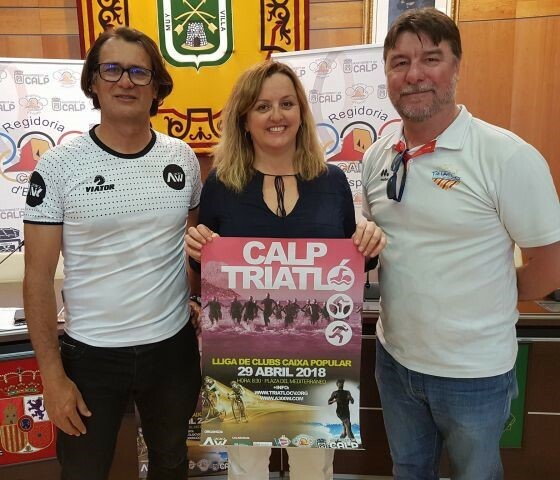 - This morning has been presented at the Town Hall of Calp the next edition of the Triathlon of Calp to be held on the Sunday 26th with a confirmed number over 500 triathletes from throughout Spain, when the inscriptions are not yet close. It should be noted that among all the registered athletes there are 116 women which is a good sign of the acceptance of this sport among women. An event that brings to Calp the favourite Sara Bonilla, runner-up of Spain Triathlon. The event will take place in the sprint mode and participants will have to complete 750 meters swimming, 18 kilometres cycling and 5.6 kilometres. The presentation was made by Ximo Rubert, of the 300w organizing company; José Luis Juan, director of competitions of the Federation of Triathlon of the Valencian Community, and the head of the Municipal Department on Sports of the Town Council of Calp, Ana Sala. "The celebration of this triathlon is an opportunity to promote Calp since all the people who will attend this event will know a unique environment," said the councillor who took the opportunity to thank the organizers who have chosen Calp for this event.